Have you ever heard of spiritual whitespace? Bonnie of Faith Barista introduced me to that term back in March of 2011 with this post. For this week's Faith Barista Jam, Bonnie gave us the writing prompt to share what God has been speaking to our hearts during our quiet times. How important it is to take time to be still and listen to His voice. After awakening each morning, I spend time praying and reading my Bible. I have my journal opened with a pen handy to record any insights I receive from this time alone. If I were to immediately turn on the TV or get on the internet, my emotions take over and rule my day. So, I make the choice to begin my day with the Lord. After all, He is sovereign. No news headline takes Him by surprise. So instead of doing ... I make the heart choice to be still. I have been doing a study on the book of Revelation. In the past, I've read through it many times. But I wanted to spend more time there and to understand it better. I found a workbook called "A Heart to See Forever" by Catherine Martin. What a blessing this study has been for me. It has challenged me to 'embrace the promise of the eternal perspective'. I have a future and a hope. I can rest in the promises of God. I am to live a life of faith. No challenge is too hard for God. The world may be in chaos with wars, elections and killings but this isn't my eternal home. I am to live a holy life growing in faith and knowledge. I am to trust all of my circumstances to God. I am to listen and ...obey His Word. Hebrews 11 is a chapter about faith. 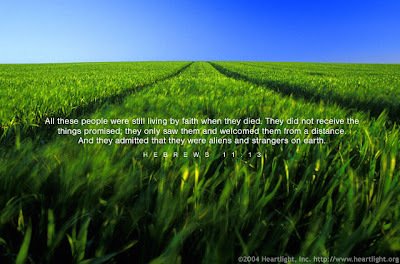 Listed are many names of people in the Bible who lived by faith. Many were tortured and persecuted. They were living by faith when they died. They were able to persevere by faith. I want to live by faith. I want to be counted faithful until my last breath. In my spiritual whitespace, God has been impressing on me the importance of walking by faith. To have an eternal perspective no matter what the news headlines proclaim. I don't put my head in the sand. But I do know that time is short and I want to make each moment count in light of eternity. May He use me as an instrument to share His light with the world. What are you learning in your spiritual whitespace? I hear Him speaking confirmation to what He's been showing me too...here in your words! :) Thanks for sharing! What a beautiful and heartfelt post this is, Debbie. I was up waiting for my daughter to come home from working late, and I had a chance to connect with my FB friends, including you. Was about to log out when I saw your status update... and here I am. This is just a perfect ending to my day. Good night, dear Debbie... I know God speaks to me as I sleep, and He will write new things on my spiritual whitespace! Thanks for sharing...eternal perspective, we all need that! The insight in your post here is great. If we could always remember these things as we go through the fire. In my whitespace I am learning to trust God with the little details as well as the big ones! : ) Have a wonderful week-end! I love " Spiritual Whitespace"; havent heard that before. Its so important to make our daily quiet time with God a pleasure instead of a duty. God knows that we live busy lives and that a great deal of our time involves taking care of business, homes and relationships, but here’s the thing; when we rush through making daily quiet time with God, it can also become a habit that pushes us away from Him little by little.